being little • bristol uk fashion & lifestyle blog. : the garden. I'm wearing my new brogues from Primark! I got them on Saturday and couldn't work out if they were ugly or awesome, but I decided on awesome. You can't really see them in these photos though so I don't know why I even bothered mentioning them. After I took these photos I got in a rage and cut my fringe off. I've been trying really hard to grow it, but it was looking SO awful and messy that it had to go! (I also had to change my top and cardi because they got all itchy with bits of hair) I'll show you my new fringe soon! I love your shorts, the brogues are definitely keepers! this is such a cute outfit. love those shorts. 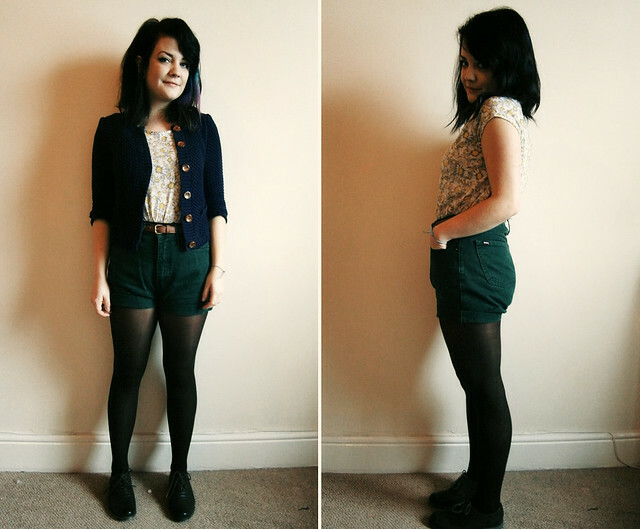 Gorgeous outfit, I love all the colors especially the green shorts! from what i can see, the shoes look really nice! dont know why ive never said this before but I love the colours in your hair - are they semi-permenant dyes? be amazing if you could do a post on it or something? my hair is dark like yours so I always assume I wont find/my hair wont take bright colours that will stay in my hair - thankyou in advance lyzi! This outfit is so cute! I love your shorts and the pattern on your top, you look lovely.